Sometimes, the big fella upstairs throws you a curved one. I have been looking at these ramekins for years at the Mill Antiques just outside Ballarat in Victoria, seeing them go from stall to stall. They are crudely made and were vastly overpriced. They look like student pieces. Anyway, recently I was browsing and came across them again. This time, the stall was closing down and everything was very heavily discounted, particularly these ramekins. It appears that the stallholder had moved locations in the complex over the years and was now closing down. So, thanks big guy. It appears that they are hand made from strings of clay coiled up to make the shape, an ancient technique for making pottery. I have no idea of who made them, when or where. They appear to be made in the 1930s or 1940s. The clay looks similar to that around Preston, a suburb just north of Melbourne. Labels: Mystery Maker Marked "CS"
Three-piece set of brown single handled bowl with contrasting interior with geometric design to base and unglazed foot ring. Short dished handle attached to exterior of bowl. Dish is brown matching gloss glazed slipware, unglazed foot ring. Swirl pattern in light brown to centre of saucer with matching colour on edge of saucer. Lid is also gloss glazed in matching two tone brown with patches of lighter brown to two quadrants. These ramekins were made in Japan and imported to Australia by Saywell Imports. Paget Sayers journey in this business began in 1963 when he started Saywell Imports with partner Ian Murray. Initially based in his small home in Woolloomooloo and then Rochford street in Erskinville and later, Wentworth Avenue in Sydney’s CBD (better parking) Saywell Imports brought a huge variety of household items , sourced worldwide. Born in the Sydney suburb of Vaucluse during the depression. Orphaned at age 16 following the death of his mother, his father having died some 5 years earlier. He began working at various jobs, even at age 19, working on a ship to England and working on an oil tanker and other trips before eventually returning to Sydney. He worked as a salesman for a couple of years before starting his own business. Some of the keys to their success were profit-sharing with the staff, free lunches for staff (only sandwiches) and some of the staff could name their own salary. These strategies were considered novel and enlightened at the time but Paget likes to think it was his "inner-Buddha" nature. It was on an overseas buying trip that Paget discovered Bhuddism. At its peak, there were about 50 employees. 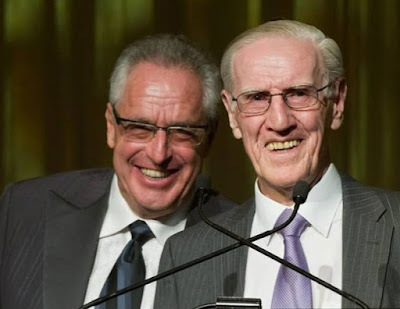 Paget is a philanthropist who devotes his time to Your Aid, who deliver charity providing education, clean water and medical services to rural communities in Cambodia and supporting the PAL Buddhist school in Sydney. Saywell Group,was a long-time highly successful furniture distribution business in Australia and New Zealand. Paget later said “I had a very successful business called Saywell Imports, but when I was 45, I decided that when I hit 50 I’d like to retire. So, when I was 50, I sold the business to a company who ruined it within four years.” Later, it was sold 2008. A company called “Saywell Importing” on the Gold Coast is not connected. Cream coloured exterior of bowl with offset unglazed foot ring. Yellow and black interior glaze with sgraffito wavy lines to interior. Reinforces semicircular handle attached to top edge of rim of bowl. Despite years of collecting, sometimes a surprise comes along. This one happened recently when I found these two ramekins hiding on the bottom shelf of a retro/antique store in Daylesford Victoria. They are from CULA Pottery, yet another small manufacturer that began after the Second-World-War. In 1946 Ex-Servicemen Ronald Frank Curnow (1914-1998), originally a Queensland boy, later of Narrabeen and William Langley (combined the first two initials of their surnames to form CuLa) purchased a small working pottery in Grenwich, Sydney (I don't know which pottery). In 1948 the partnership was dissolved. Just who continued, I also don’t know. In 1950 the works were relocated to larger premises at Brookvale in the Wahringah Shire in Sydney. Into this pottery came master potter and mould maker Ken Day. Ken had previously worked for Diana for many years. He made moulds for CULA and other potteries at this time. It is better than even money that he made the moulds for these ramekins. 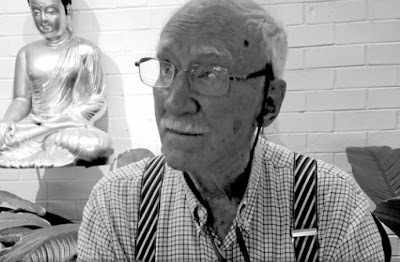 He began his own pottery “DAYEL” in 1955 and operated it until 1957. The CULA pottery closed in 1958, most likely yet another victim of the trade agreement with Japan. Ken then set up as a contract modeler in the old Martin Boyd pottery. CULA made a variety of slip cast wares including these ramekins glazed in a variety of dark orange through to brown. Like many potteries of the time, cultural appropriation was not considered and some were hand decorated with Aboriginal motifs or flowers and marked “Cula” either painted or inscribed. Unusually, these ramekins have an offset base that makes them sit on an angle. Cream coloured bowl with thickened rim and cream interior and unglazed foot ring. Transfer printed (as above). Very Good, small chip to rim of one bowl. Question? When is a ramekin not a ramekin? Answer; When it’s a bowl. Just because you call a bowl a ramekin doesn’t make it so. These bowls made by Maxwell and Williams have the word “Ramekin” printed on the side. Well, they can call their product whatever they like, but by my definition, they are bowls. Beautifully made but still bowls. Nevertheless, theirs is still a story that needs to be told. Don’t look for much on the web because you won’t find it. They are a private company owned by a very private family, so I won’t tell you too much. Maxwell and Williams are yet another success story created by migrants escaping the chaos of post-war Europe. The Maxwell and Williams story is an interesting one. 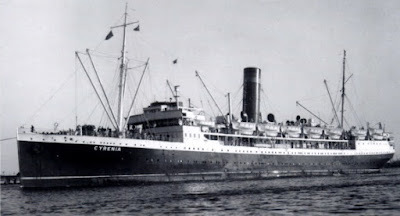 Heinrich (Harry) and Anna Grundmann, German migrants, arrived in Australia on the 17th of January 1952 aboard the migrant ship “Cyrenia”; a creaking old Greek ship built in 1911. The ship sailed from Piraeus in Greece to Fremantle Western Australia. Another website states that they were holocaust survivors. On Board were 6 people named Grundmann, only Heinrich and Anna travelled on to Melbourne. After working as a salesman, Harry decided to go it alone. He began his own company H.A.G, combining his and Anna’s initials. The company began life in a small garage at their home in Clinton Street in the Melbourne suburb of Brighton East. Their story is one of talent seizing opportunity. The business began at just the right time because Australia had signed a trade agreement with Japan in 1957. The grandfather of the current Japanese Prime Minister Abe signed the agreement with our then Trade-Minister; ”Black Jack” McEwan, opening the door to a range of imports not available previously. (It also almost killed our studio pottery industry). It was abrave thing for the Post-War Government to do. 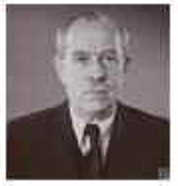 Maxwell and Williams are Max Grundmann, son of Harry and Anna and Bill (William) Ryan, Max’s business partner. The company operates in over fifty countries worldwide and employs around one hundred people. Max was studying at Monash University in Melbourne when he realised that he had inherited a love of sales from Harry. He joined the company in 1974 and took over when Harry suffered a heart attack in 1978. That is when Bill joined the company. Bill had a background in finance. The business really took off when they marketed the “Krosno” brand and the Maxwell and Williams name was born in 1995 when Max was staying in Europe. After doodling “Maxwell and Williams” on a paper table cloth the name was born. I believe that this piece of paper is now framed and hanging in their offices. They also have a range called "White Basics" that have a "Ramekin" with fluted sides, that has similar dimensions. Much of the fine porcelain produced these days is made in China. Even though these do not have a country of origin marked on the, I think it reasonable to conclude that they are of Chinese origin. Small rectangular bowl with rounded corners sloping to base. Heavy green speckled gloss glaze to interior and exterior. Unglazed foot ring. Handle extending from upper third of exterior of bowl, grooved on top. Pickings have been a little slim on the ramekin front lately, so it came as a surprise when these came up on E-Bay recently. Almost unknown in Australia and still rare in their native Sweden, these ramekins are unusual in that they were made by a company that specialised in wooden products in the pre-internet days. The large ramekin with lid is approximately 22cm wide (including handle) x 110mm high. The opening is approximately 120mm wide and the base is approximately 95mm wide. It weighs approximately 670 grams. Impressed to the base is "Sweden 520-2" and makers mark and there is a sticker on the lid. The smaller ramekin with pourer and lid is approximately 16omm wide (including handle) x 80mm high. The opening is approximately 75mm wide and the base is approx. 65mm wide. It weighs approximately 245 grams. On the base is "Sweden 520-2" and makers mark and there is also a sticker on the lid on this piece. 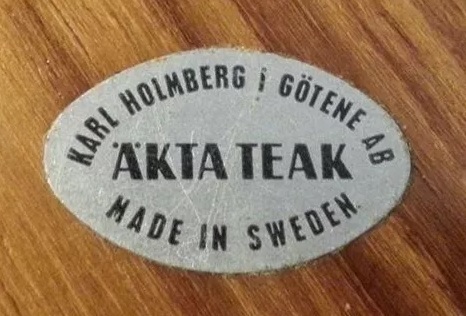 The stickers read "Karl Holmburg Gotene UGNSELDFAST (Heat Resistant) Made in Sweden". The wooden tray is approx. 500mm long x 100mm wide x 20mm high and has a heat branding stamp. This pottery ramekin/tapas set was made in the late 1960s in Sweden by Karl Napoleon Holmburg (1883-1955). The set comprises 4 square ramekins, 1 large ramekin with lid, 1 smaller ramekin (saucier) with pourer & lid and the wooden serving board of Bangkok Teak (Tectona Grandis). In those days, Teak was an expensive, exclusive timber used for high end products. It was known as “Burmese Teak”, because at the time, half of the world’s teak came from Burma (today’s Myanmar) and was used for furniture and small wooden products. Karl Holmburg, a Carpenter, began making furniture in the early 1920s at Gotene in Vastra Gotland, Sweden. He started by working with his father Anders Johan Holmburg, also a Carpenter in the family business that Dad began in 1903. They initially made exclusive designer furniture to order for the larger furniture store such as Nordiska Kompaniet (NK) in Stockholm and Gothenburg. Anders died in 1927. The company expanded slowly over the next 30 years and by the early 1950s, they employed around 20 staff. At that time, they restructured and production switched to teak products for the home, mainly kitchen items such as trays and bowls. Karl’s sons took over the running of the company with elder son Karl-Eric in charge. In the 1960s, the company launched its own teak cutlery series by which time they had around 100 staff and were Sweden’s largest maker of teak products. This couldn’t last and by the late 1960s, fashions had changed and despite attempts to diversify, the company was bankrupt by 1973. Teak had become much more widespread and commonplace by then. It is odds-on that the tray was made by Karl’s company but it is likely that the ramekins themselves were made by Rörstrand, now part of Iittala, having moved their production to Sri Lanka and Hungary. In 1926 the company moved from Stockholm to Gothenburg and again from Gothenburg to larger premises at Lidköping in 1936. In 1983 Rörstrand was bought by Arabia and in 1987 they merged with Gustavsbergs Porslinfabrik. In 1990 Rorstrand were taken over by the Finnish Hackman Group. Between 1960 and 1990 Rörstrand had several owners, including Uppsala-Ekeby, Finnish Wärtsilä and Hackman and Gustavsberg . Check out my post for them for more information. Iittala is a design company from Finland that specializes in housewares. In December 2005 their factory in Lidköping closed, ending almost 280 years of local manufacture. The former porcelain factory is now the Rörstrand Centre containing a museum, restaurant, art gallery and outlet store. The museum contains one of the best collections of porcelain in Europe. I should point out that none of the Rörstrand ceramic designs are in any way similar to these ramekins and to further confuse things, as mentioned earlier, they were taken over by Upsala-Ekeby in 1964. (Uppsala-Ekeby began manufacturing porcelain in Uppsala in the 1960s because of increasing sales.) There are some similarities in colour and design with a few of the Uppsala-Ekeby products. Mystery Maker Marked "Michelle Dubois"
Mould formed ramekin and plate combination apparently made for a child. Ramekin set to side of plate. Hand painted animals to plate. Exterior of bowl painted green with interior streaked yellow-ochre colour. It has been a long time since my last post. Lots have happened and this little treasure has been on my shelf for quite a while. I have not found any information about this maker and would appreciate any assistance.